Love the experience you’ve had at Steve’s Auto Care? Consider referring a friend. By simply telling your family and friends about us, you get discounts on your future services. And as a new customer, they’ll receive that discount as well. It’s a Win/Win! 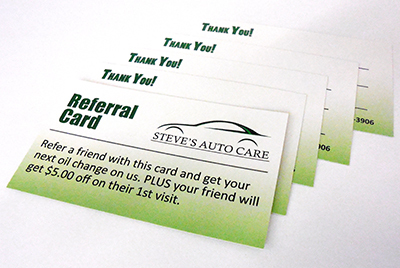 Pick up a Referral Card on your next visit to Steve’s Auto Care. When a referred customer brings in that card, s/he will receive 5% off parts and labor – and you receive a Free Oil Change on your next visit!